Recently I’ve been listening to lots of songs from various musicals (both stage and screen) on Youtube. Just in the mood for it, that’s all. Maybe one of these days maybe I’ll write about how wonderfully engrossing I find musicals. 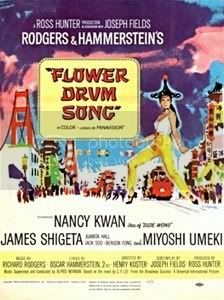 Anyway, whilst hopping from song to song, I came across songs from Rodgers & Hammerstein’s Flower Drum Song and I thought, “Ah, I’ve not watched that one yet.” So I watched it. Sammy Fong (Jack Soo) is the owner of a night club in San Francisco, and his mother has made arrangements for him to marry a girl from China named Mei Li (Miyoshi Umeki). But Sammy already has a girlfriend – Linda Low (Nancy Kwan), the star of his night club’s shows. He tried to solve the problem by recommending Mei Li to Master Wang (Patrick Adiarte) as a bride for Master Wang’s son, Wang Ta (James Shigeta). Unbeknownst to Sammy, Ta has met Linda and is smitten with her. Linda twists Ta round her finger and gets him to propose to her, partly as a way to force Sammy’s hand and partly from desire to have a more stable life. This complication upsets everyone – Ta’s family, Sammy, Mei Li – and drives the rest of the story to its rather expected ending. I have to say that I wasn’t particularly impressed by the film. There was something lacking in it – it didn’t have the same exuberance or fun that The King and I or Sound of Music had. (I might like it a teensy bit better than Carousel though. Carousel was rather depressing.) It’s not entirely the fault of Rodgers and Hammerstein, even if it wasn’t their best work. Some of the songs are still nice – I particularly liked “Love, Look Away”, “I Enjoy Being a Girl” and “Grant Avenue.” “Chop Suey” was a cute piece too. It’s just that somehow the movie was missing a certain spark. Can’t put my finger on exactly it is that was missing in Flower Drum Song. Some people might find the character stereotypes offensive but it didn’t bother me. I’m not often bothered by stereotypes somehow, unless the stereotypes are persistently negative ones. I just found the characters in Flower Drum Song kind of amusing. They’re not entirely inaccurate either, I’d think. I liked that Mei Li was not pretty in the usual sense – she looked very Oriental, with the narrow eyes, single eyelid, low nose and rounder face. I always find it a bit of a comfort when characters are not good-looking in the normal way. The costumes for the “Grant Avenue” piece looked cheap and a little bit silly. This annoyed me. James Shigeta’s singing voice has pleasant, rounded quality to it. The opening credits were accompanied by some beautiful, bright watercolour paintings by Dong Kingman. I appreciated that they’d gone to the trouble of finding a cast of Asians (or mostly Asians anyway) for the film.